This article explains how to manage and scan your Native Instruments VST plug-ins in Sonar. On a Windows computer, the VST versions of the software can be installed in any location on your hard drive. Follow these steps to find out in which directory your VST plug-ins are installed. Note: You can set these installation paths in Native Access' preferences as explained in this article. Depending on whether you are using the 32-bit or 64-bit version of Sonar you have to assign the corresponding path in Sonar's VST Settings. Open the VST Settings tab from the Preferences. Under VST Scan Folder(s) you can see the directories where Sonar currently loads the VST plug-ins from. In this example, the plug-in path is set to the 64-bit plug-in path because we are using the 64 bit version of Sonar. In case the folder where you installed your VST plug-ins does not appear in the list, click the Add... button and navigate to this directory. Then click OK to confirm. After adding a new VST path, press the button Scan VST Folders in order to make its plug-ins available in Sonar. 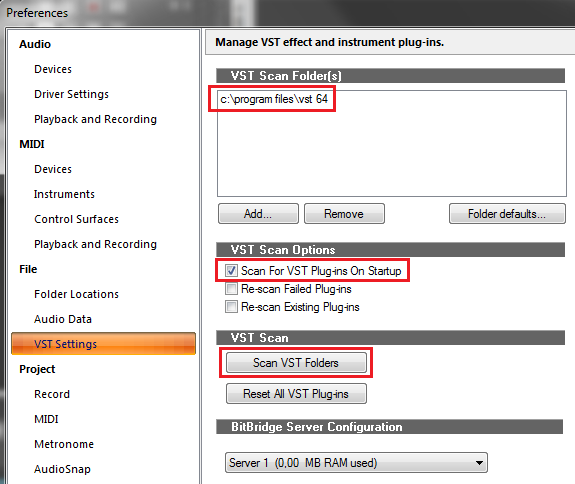 Make sure the option Scan For VST Plug-ins On Startup is active.